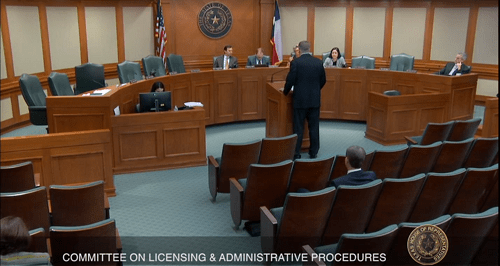 HB1141 was discussed in the 2nd half of the Licensing & Administrative Procedures committee meeting on Tuesday March 26. it appears that several people who planned to testify didn’t make it back to the meeting after ta recess was called to allow representatives to attend the House Session. TBFAA President Kelly Ryan presented the TBFAA position against the bill noting the affects it would have on fire alarm, commercial sound, and networks. It was also noted that security and fire contractors already follow the National Electrical Code (NEC) and this bill would create collateral damage to the alarm industry. Two members from the Independent Electrical Contractors (IEC) testified for the bill stating it was a matter of “safety” that network cabling require an electrician license, and that PoE puts out enough power to cause cardiac arrest. CEDIA testified against the bill, but didn’t go into a lot of details. Kelly Ryan added “I personally want to thank the members that emailed the committee reps as we will continue to work against this bill”.